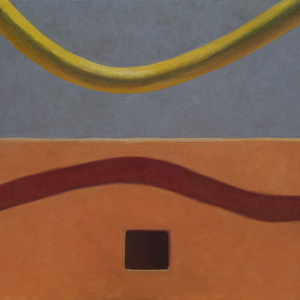 Untitled, 1959; cardboard, paper, and wood collage on board, 36 x 48 in. After seeing the recent exhibition of Matisse cut-outs at MoMA, I've been more alert to the possibilities of collage, even including pasted shapes in some of my own potato prints. 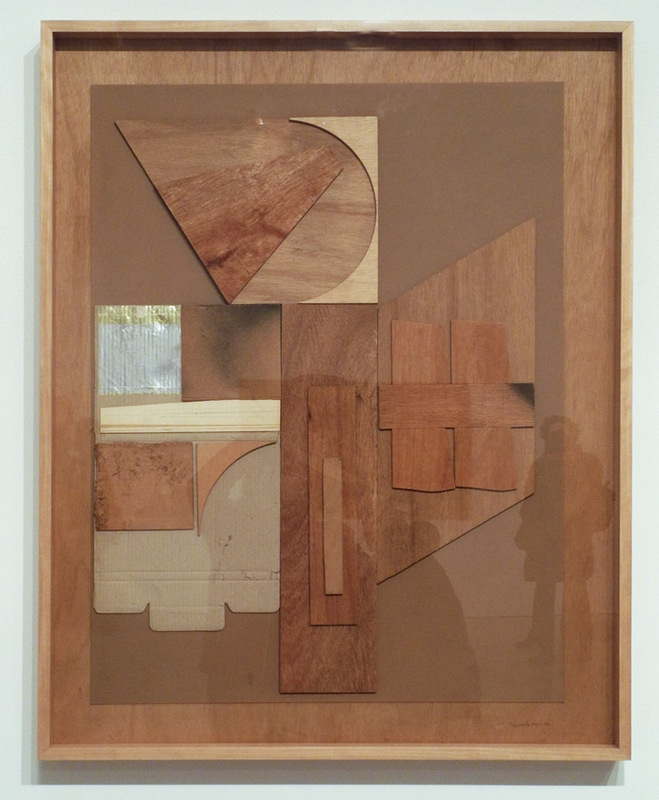 So it was a real treat to see a recent show of Louise Nevelson's powerful collages at Pace Gallery. 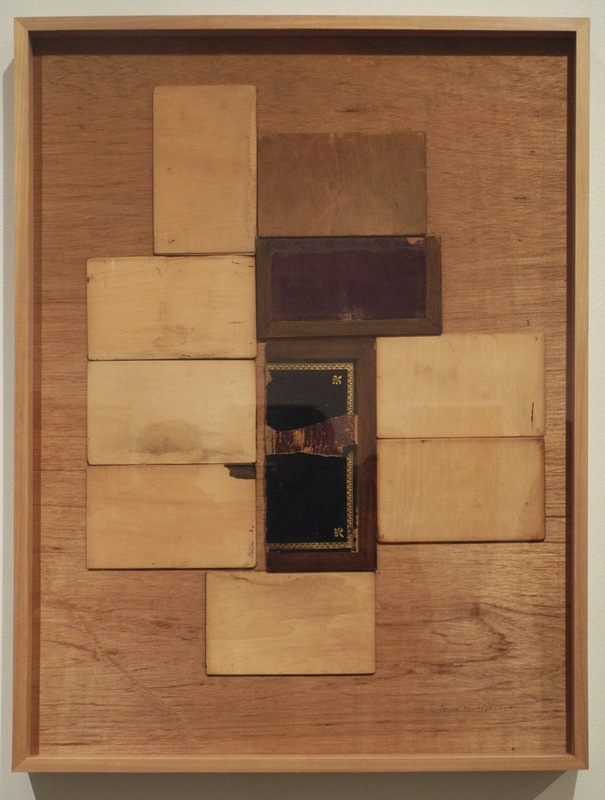 The show included several later assemblages, but what most interested me were the earlier, flatter works, of various materials pasted onto wooden boards. 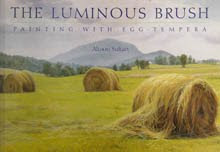 The images are graphically strong, the use of materials wide-ranging and inventive; anything that came to hand was of use. Of course there is a strong tie to the earliest collages (from the French coller, "to glue") by the Cubists Picasso and Braque. 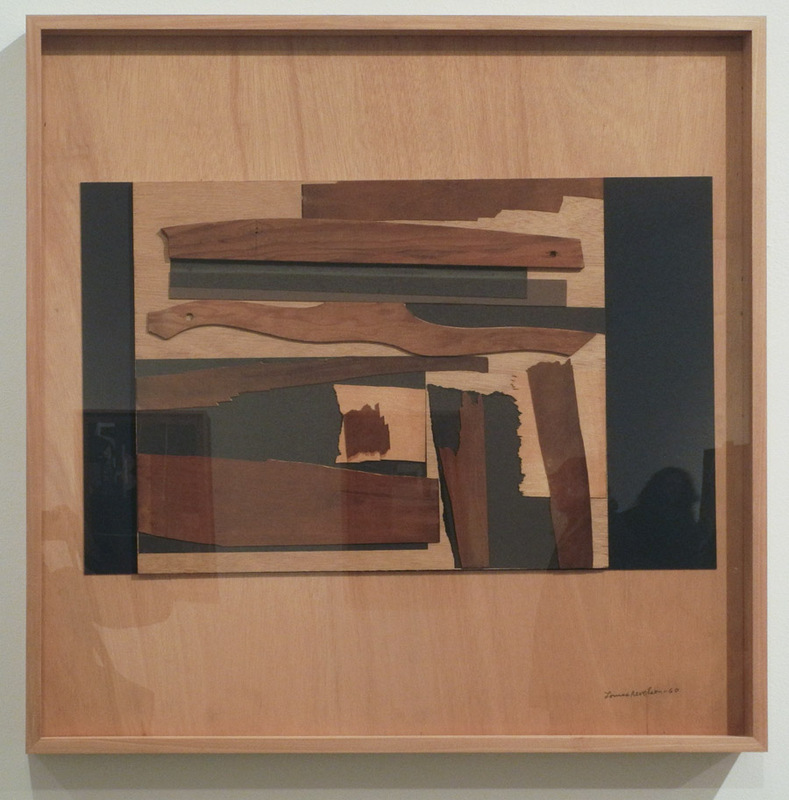 Nevelson's work might be closer to that of Kurt Schwitters, who made wooden collage/assemblage constructions, and built entire environments. 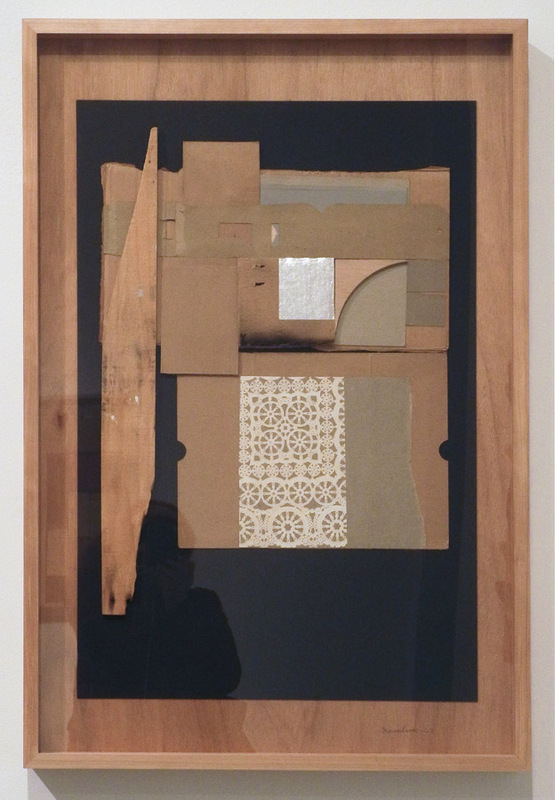 Untitled, 1956; cardboard, foil, paint, and wood collage on board, 46 x 36 in. ....the flaps of a flattened cardboard container add gentle angles, the verticals of the corrugation repeating the larger wooden verticals alongside. 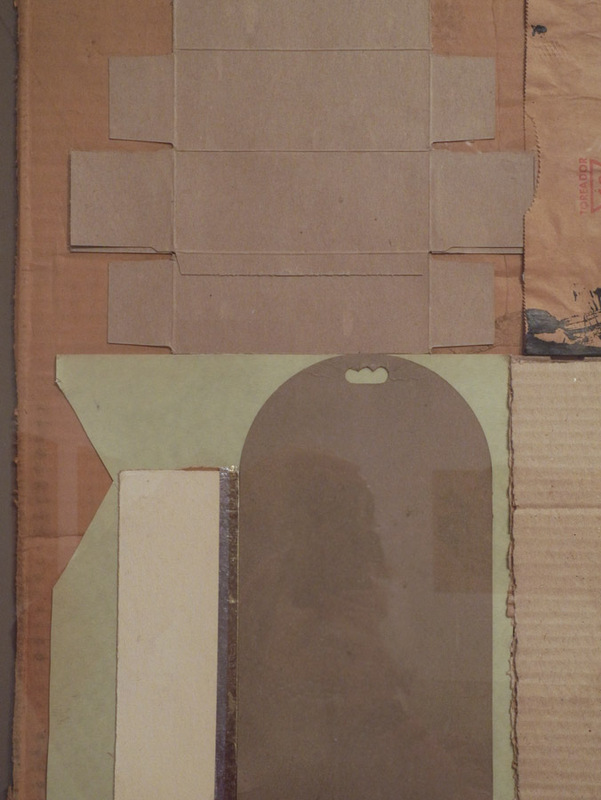 Untitled, 1959; cardboard, foil, paint, paper, and pencil collage on board, 46 x 36 in. This piece emphasized verticality, but balances that with horizontals above the tall, thin verticals, tops it off with a large broken curve, and surprises us with a black lacy semicircle. I love the lines of circles at the bottom of the cardboard shape. We have a strong sense of knowing where the ordinary stuff used to make these collages comes from––a doily, a box that held cans––but it is transformed into the stuff of art. The elements have an architectural feel to them, as though the forms reference built structures. The color, though subtle, is very beautifully adjusted, one surface to another. 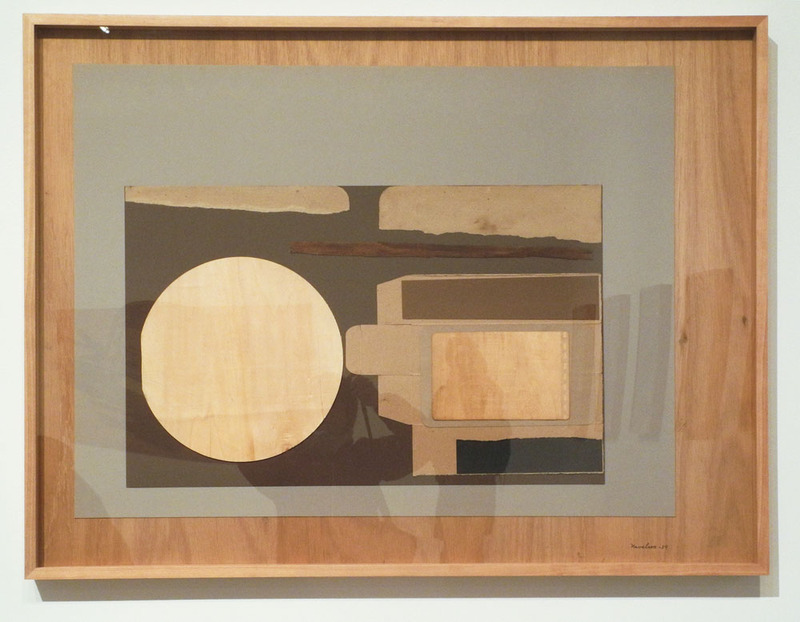 Untitled, 1960; cardboard, paper, pencil, and wood collage on board, 36 x 36 in. Elegantly curved forms are alongside pieces of wood that are torn and jagged; the deep browns and blacks make the work an elegy. 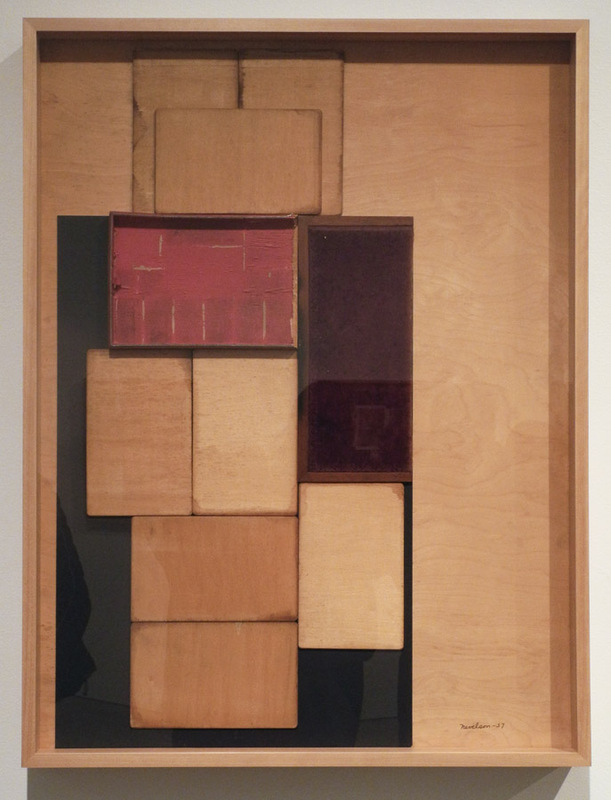 Untitled, 1957; fabric, leather, and wood collage, 40 x 30 in. 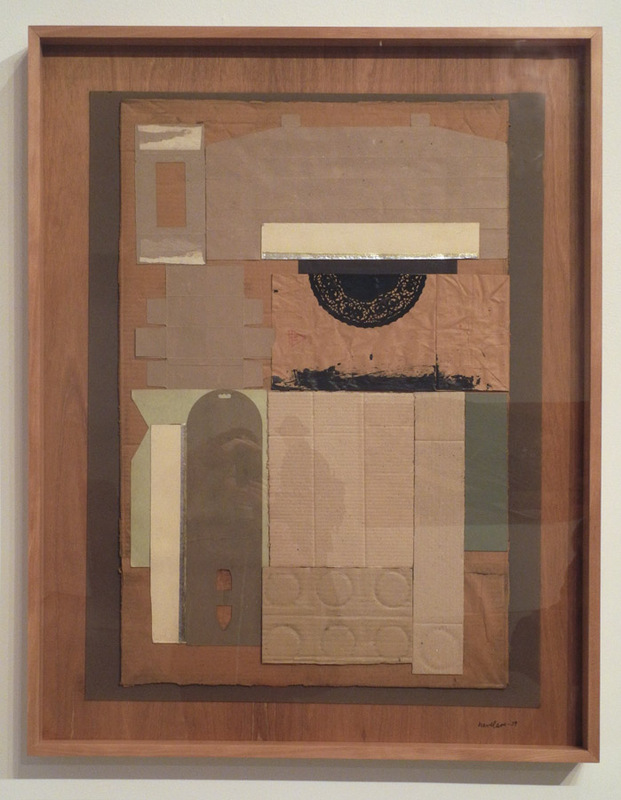 Untitled, 1957; cardboard, metal, pencil, velvet, and wood collage on board, 40 x 30 in. The two pieces above may be my favorites in the show: the stacking of rectangular elements is so satisfying to my eye. And then there is the reference to books in the shape and in the use of what look like leather bindings. 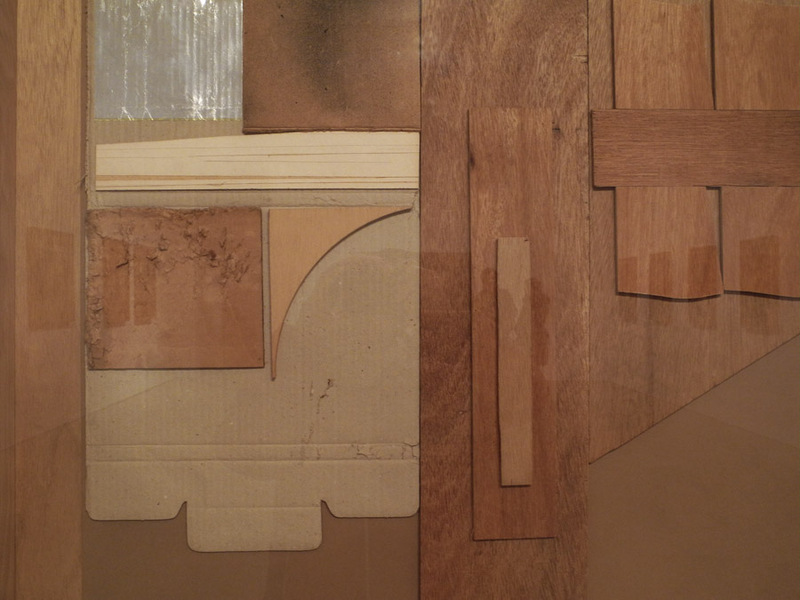 Untitled, 1963; cardboard, foil, paper, spray paint, and wood collage on board, 36 x 23 7/8 in. 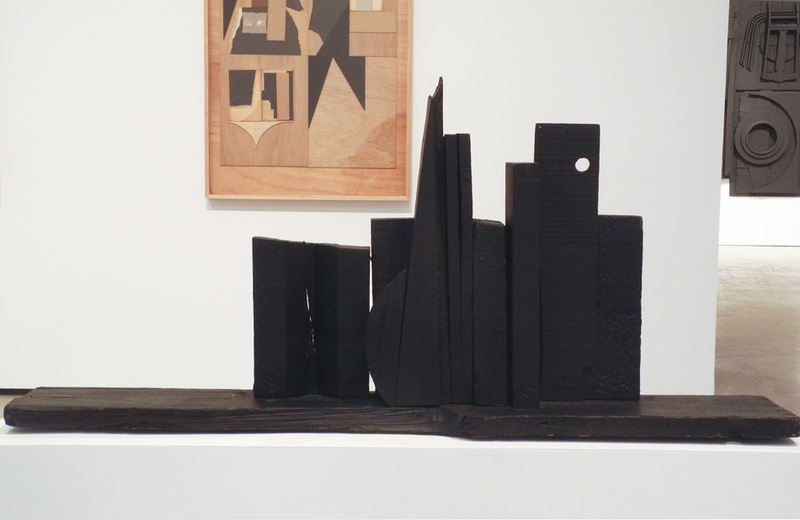 The regularity of those rectangles is unusual, though, in Nevelson's body of work; she reveled in combining disparate elements and making them into a whole. In the gallery press release she is quoted as saying "the way I think is collage". Untitled, 1963 is emblematic of her putting one seemingly disconnected thing next to another––a torn piece of wood and some lace; aggressive next to sedate, irregular next to patterned––and making a unified statement. Moon Spikes, 1953; wood painted black, 22 3/4 x 49 3/4 x 7 3/4 in. When I compose, I don't have anything but the material, myself, and an assistant. I compose right there while the assistant hammers. Sometimes it's the material that takes over; sometimes it's me that takes over. I permit them to play, like a seesaw. I use action and counteraction, like in music, all the time. Action and counteraction. It was always a relationship – my speaking to the wood and the wood speaking back to me. wasn't that a great show? I loved it too. She was so ahead of her time. Yes, it was a terrific show; I'm so glad I was able to see it. I like these very much. I like her large monochromes, too. They have such a different impact. These are gentler, less overwhelming. It's interesting to see her range which apparently was really large. I hadn't seen these. They deepen my respect for her. Connie, I agree that seeing these increases the range of her expression in an interesting way. I'm glad you like them too. I love these. Thanks for taking me along on your visit to the show, Altoon.